Experience the rebirth of handmade cigars in the USA by passionate, Cuban-born artisans on this guided, 1-hour, small-group tour in Tampa. While exploring the factory boutique, see the recreation of old-world Havana at a time when relations with Cuba appear to be headed in a new direction. 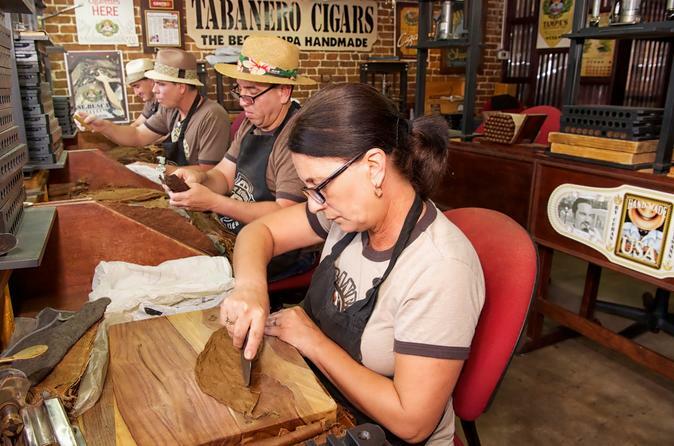 Experience the methods utilized to make the world's finest cigars in historic Ybor City, the once and future cigar capital of the world. A cup of Cuban coffee is included. Meet at the Habanero Cigars Factory in Tampa in late morning or afternoon, where the guide will provide a wealth of information. Find out how Tampa was built with the cigar industry. Discover the process of manufacturing the hand-made cigars with the cigar rollers at work and the quality control process at the Habaneros factory. Venture into the walking humidor and learn about the aging process. Experience the different aromas by inspecting the tobacco leaves in the humidor. At the end of the tour, enjoy a presentation on how to cut, punch, light, and set off the hand-made cigars the correct way.